If you are looking for a Father’s Day gift for a gamer, you are in the right place! Featured today in Theresa’s Reviews 2017 Father’s Day Gift Guide For Gamers, you can find some of the top video games and accessories available on Father’s Day, which falls on Sunday, June 18th this year. Whether you are looking for a big or small gift, Game Stop has items to fit any budget. 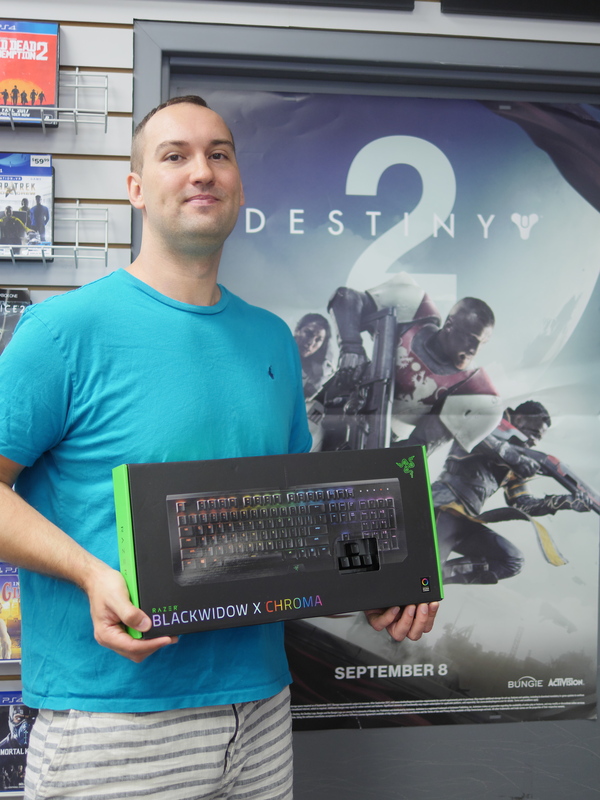 From small novelty items to the latest virtual reality and pre-order video games, the store carries everything a gamer could want. To get an idea of what types of video games and accessories are out, I visited my local Game Stop and did a live Facebook video about the products we saw in the store. The store clerks were very knowledgeable and helpful. Check out some of the most highly recommended games and products. Released on June 6th, 2017, Morrowind is the first Elder Scrolls online expansion. Available for PC, XBOX One and PlayStation4, the game is ideal for people who already own the game online and can upgrade. You can also buy this product as a standalone with the original Elder Scrolls online included. Featured below is the Elder Scrolls Online Morrowind Collector’s Edition. One of the most exciting advancements in gaming is virtual reality. While still in its infancy, some great products are already out now. Game Stop offers a wide selection of virtual reality. For people with a PlayStation4, the PlayStation VR makes the most sense. You can additionally purchase the PlayStation Move Motion Controller and you will need the PlayStation Camera. Since purchasing all of the items separately can be confusing and more expensive, you can also purchase the PlayStation VR Until Dawn Bundle, which comes with everything you need as well as a game. Before purchasing, make sure the gift recipient already has a PlayStation 4. If you have a powerful PC, there are a few options, but we really liked the HTC Vive Virtual Reality System that we saw in store. Now at Game Stop, if you purchase the HTC Vive before June 30, 2017, it comes with a free game, Star Trek: Bridge Crew. At $799, the HTC Vive is one of the most expensive, but it is also considered one of the best, or the best, virtual reality sets out currently. For all the gamers looking to buy this for your PC, make sure that your system is updated enough to handle the requirements. If the person you are shopping for owns a PC, upgrade to get a mechanical keyboard. With the Razer Blackwidow X Chroma Keyboard, you can get a faster and more accurate reaction time. Because of the mechanical keys, the keyboard would be perfect for the pre-order of Destiny 2, a very popular, upcoming multi-player game. If you shop in the store, you can come across awesome finds perfect for any dad. From Star Wars memorabilia to classic video games, you can find a great range of products. Walking through the store, I came across an I Am Your Father Mug. I would have never found this by shopping online. This small gift would be excellent to add on to another gift, or to let your children pick out something for their dad. One of the hottest new consoles to come out is the Nintendo Switch. 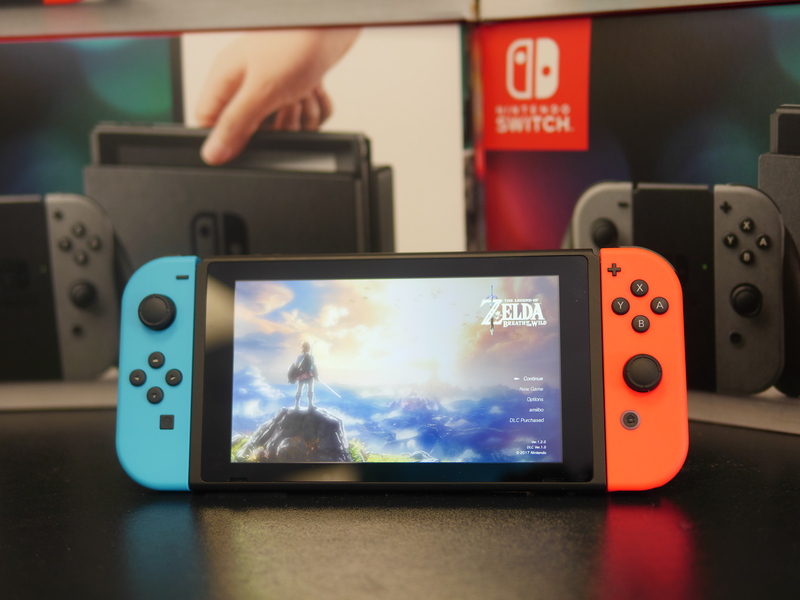 Although the Nintendo Switch is hard to get because it is such a popular item, the store manager was nice enough to bring in his personal Switch for us to try out in store. My children were excited to play the new Mario Kart 8 Deluxe. One neat feature is that you can attach the controllers to a steering wheel, so in the game you are actually steering the car. Not only is the Nintendo Switch a gaming console, but it can also go with you anywhere you go. You simply turn it into a handheld system. The device is lightweight and easy to carry. 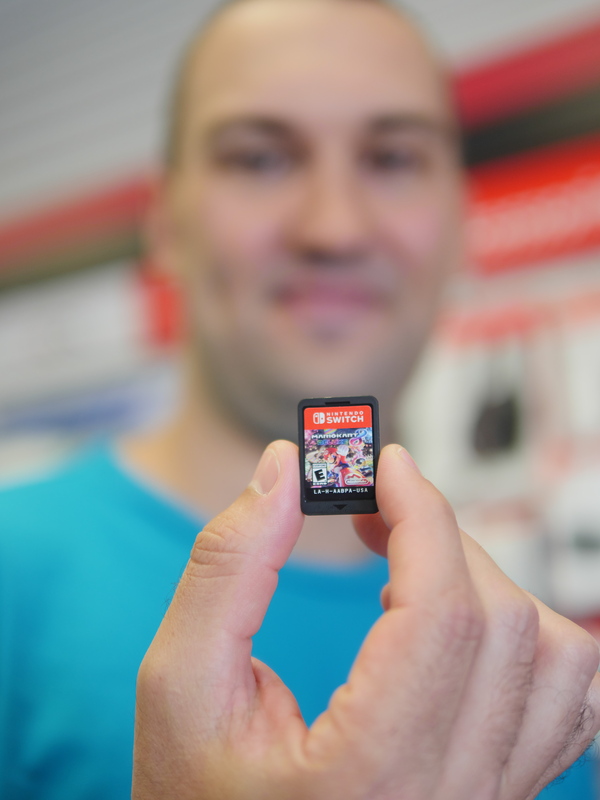 Even the games themselves are tiny. Also, from your television to the screen on the Switch, the graphics are very crisp. My husband, who has been a fan of Nintendo since it first came out, got to play the new Zelda and re-live his memories of when he played the original as a child. If you are not sure what to get as a Father’s Day gift, you can always get a gift card to Game Stop. Along with the gift card, your husband can also bring in any of his old products to trade in for newer games to help increase the value of his new purchase. For more gift ideas, follow Theresa’s Reviews on Facebook, Twitter, Instagram, Youtube, and Pinterest. My husband doesn’t have a whole Lotta time for video games but my son with you love to take this gift instead of him. This year we got my husband tickets to a baseball game . These are great ideas. My husband isn’t a big gamer but he does play with our son from time to time. They have certain games they love. OK, my kids would LOVE to give their dad the I am Your Father mug! Guess I am headed to Game Stop this weekend! I was rolling when I saw that mug. I am your father. Oh wow, I need to get one of those! First off, your hubby has a great smile!! Secondly, I remember seeing the Nintendo Switch around the holidays but just wasn’t sure about it then. I think it might actually be great for my little ones to play with my hubby because they know how to “steer” a wheel! Good ideas! We don’t have a video game system at home. My dad does but not sure if he plays it that much. I’m still stuck on what to get my husband for Fathers Day. You have created a great list for Fathers Day. We already own a Nintendo Switch, which is FAB!! I am liking the cup tho!! My partner is a gadget geek and would love the Virtual Reality probably!! Yes I love game stop! My dad isn’t much of a gamer, but I am! My husband is totally a gamer and he loves Game Stop. He would love something, even a gift card to Game Stop! Ohhh my husband is just dying for a Nintendo Switch! Those are some fun suggestions! We’ll have to check them out! Oh wow, my husband isn’t a gamer but my oldest son is so this is giving me ideas for HIS birthday! This is a fabulous guide and perfect for the gamer guy! There are so many cool gaming gear items coming out all time. I’m excited about VR and I’m not even a gamer, but I can see how it would make the coolest Father’s Day gift. This is a great list of gifts for those that are gamers. My husband would love most of these gifts but he doesn’t have the time to game anymore. GameStop is the only place to go if you need a gift for a gamer. All of these things look so much fun! What a fun list! Father’s day is always hard, but these are some great ideas! That mug is awesome! My husband and eight year old daughter have been playing video games together since she was very young so a new gaming device would be a great gift for him from her! And I’m sure little sister would love to get in on that action too! This looks so perfect! I love watching my kids play with their dad and I know they would love to get him something like this. Both my son AND my husband want a Nintendo Switch. I don’t know much about gaming so this is a great guide! My husband works in the tech/entertainment industry so we have every gadget available. Seriously. He got a VR system for xmas and honestly we have barely used it. My husband doesn’t play video games anymore, but I feel like some of these he would still love! My husband is not a gamer, but my sons are, however, they are not fathers yet. Haha. I think this would be a good gift for my sons on their birthdays or for Christmas. Thanks for letting me know about it. I will share this with my sister. Her husband is into gaming. I always have the hardest time finding gifts for my hubby. He is so picky but I think he’d love all of these choices! Sweet! I love the VR kit. My husband doesn’t do any gaming whatsoever, but my son on the other hand….he’d love this. I love these gift ideas for gamers. We have a Nintendo Switch and it is so much fun watching my family play the games and having a good time. This is awesome. My hubby is a huge gamer. I really want to get the keyboard for him. We just recently got him a gopro so I am leaning towards getting other accesories to go with it for Father’s Day. Great post! My brother is a father now and I’m sure getting him one of these gifts!